NYFW is pretty stressful, so it's nice to have something to just grab and run out the door with. Something easy. Easy = suit jacket and pants. I'm always looking for new styles and fits. Picked these high waisted pants at Express, it's a cropped style fit and basically goes with everything. Wore this the other day before full day of non-stop headache / meetings / shows and naturally parties...can't not party. Very cool look today. I have to say I love the fun shape of the sunglasses. Have fun at NYFW! Stylish suit and the accessories are amazing! Really love the shape of your sunnies! Super unique! Can we talk about that bag?? I NEEED! Love your outfit, I've been looking for a black blazer, yours looks like the perfect one! Amazing! 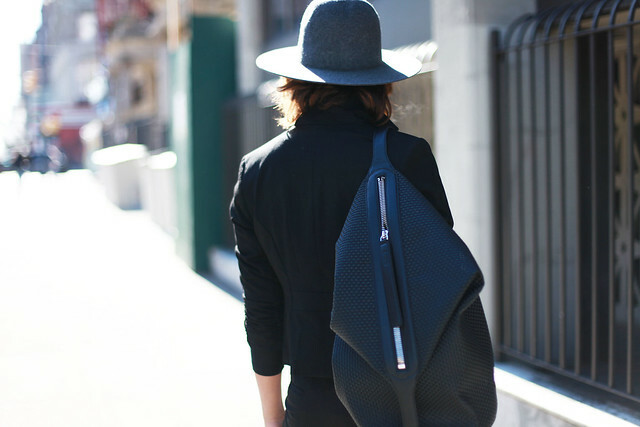 Hat, sunnies and bag pack are all so cool! Amazing outfit! You look great in this and i really like your Backpack.!! the bag is amazing! I love the cozy look of your outfit! it's all about the shades in this one! Loving this look! The boots look fab, You always look so effortless and cool! Love the booties with the rose gold toe cap! LOVE your sunglasses! Also loving your boots and the gold detail! Comfortably chic! Love it!! great look.. love your sunnies most..
your sunglasses and the shoes are really amazing. Your sunglasses are so cute! It looks like you got them from my favorite website fixateboutique.com . Wow!! Those shades are so cool!! You can totally rock them!